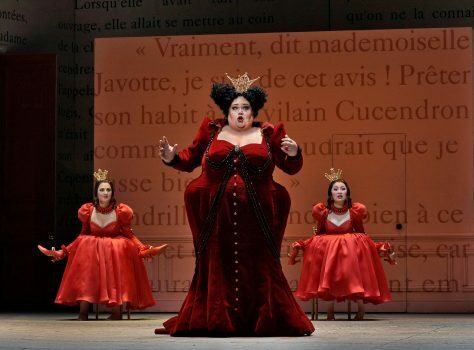 NEW YORK—Jules Massenet’s 1899 fairy tale opera “Cendrillon” (Cinderella) finally arrived at the Metropolitan Opera. 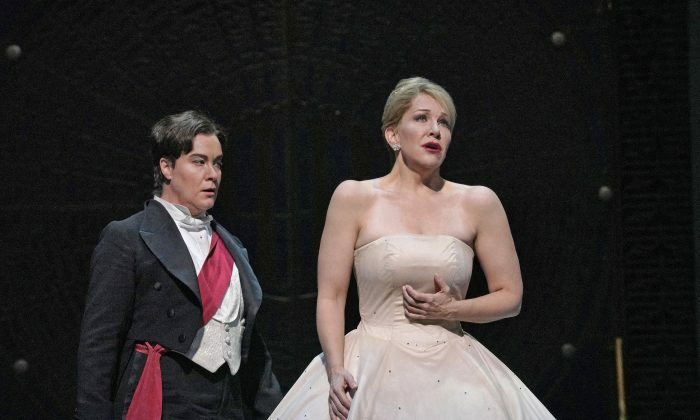 It was clearly ladies’ night on stage with the glorious mezzo-soprano Joyce DiDonato in the title role and mostly other divas, including another mezzo, Alice Coote, as Prince Charming. “Cendrillon” has a libretto by Henri Cain that is adapted from the popular 17th century fairy tale by Charles Perrault. At the beginning of the opera, Cendrillon’s widowed father, Pandolfe, has a second wife, the shrewish Madame de la Haltière. She has two daughters, Noémie and Dorothée, who pick on Pandolfe’s daughter from his first marriage, Lucette, also known as Cendrillon. Pandolfe is unhappy about the situation but is too weak-willed to stand up to his wife and stepdaughters. The women are preparing for a court ball, but Madame de la Haltière bans Cendrillon from attending. After the others leave, Cendrillon’s fairy godmother appears, complete with accoutrements: a coach, horses, a glittering gown and glass slippers. She also promises that Cendrillon’s family won’t recognize her. The only drawback is that Cendrillon must leave the ball before midnight. Everyone at the ball is having a good time except for Prince Charming. He’s in a funk because the king ordered him to get married. The young man is not impressed with the selection of eligible young women on display until Cendrillon arrives. Everyone is taken with her beauty except Madame de la Haltière and her daughters, who don’t understand what all the fuss is about. Nevertheless, the Prince and Cendrillon fall in love at first sight. Following her fairy godmother’s orders, Cendrillon has to rush out at midnight. Once she is back home, Cendrillon discovers that she lost one of her glass slippers at the ball. Madame de la Haltière and her daughters return and resume their usual practice of insulting Pandolfe and his daughter. Madame de la Haltière then badmouths the “unknown stranger” at the ball, claiming she didn’t impress the prince or the courtiers. After harsh words between Pandolfe and Madame de la Haltière, he finally works up the gumption to order her and her daughters out of the room. Pandolfe confides to Cendrillon that he’s had enough of the mistreatment and floats the idea that they run off to his country estate. This idea appeals to her, but she soon falls into a depression and decides to end her life in the forest. It turns out that the forest is a festive place, with dancing spirits. Prince Charming and Cendrillon turn up and reaffirm their mutual love. Cendrillon reveals to the Prince her real identity as Lucette. The Fairy Godmother grants them dispensation and they fall into an enchanted sleep. Pandolfe discovers Cendrillon in the forest and brings her back home to revive her from what appears to be sleeping sickness. When she regains consciousness, he informs her that she had spoken in her sleep about the ball and Prince Charming. He convinces the girl that the whole experience was a dream. Then, Madame de la Haltière, Noémie, and Dorothée rush in with the news that that the king (who is determined to see his son marry) is searching the country for the mysterious beauty the Prince met at the ball. For some inexplicable reason, Madame de la Haltière thinks it is one of her daughters, and they all head off for the royal court. They are told that the young woman had left behind a glass slipper and whomever it fits will become the prince’s wife. The prince has no luck with the shoe fittings until Cendrillon and her fairy godmother arrive. The shoe fits Lucette and love conquers all. Joyce DiDonato looks and sounds perfect for the role, which she has been playing around the world since 2006. She first sang it in Santa Fe, New Mexico, in a production directed by Laurent Pelly and that is the enchanting production at the Met. Pelly is also the costume designer. Massenet wrote the lead roles for women with the sole exception of Pandolfe (sung with style by French bass-baritone Laurent Naouri). The rich-voiced mezzo Stephanie Blythe is obviously enjoying herself immensely as the obnoxious Madame de la Haltière. Ying Fang and Maya Lahyani also seemed to having fun as Noémie and Dorothée, the two evil stepsisters. 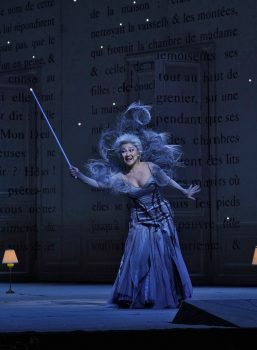 The Fairy Godmother is played by the effervescent South Korean coloratura soprano Kathleen Kim. Alice Coote was properly boyish as Prince Charming and made a convincing partner for Cinderella. Massenet’s score may not be on the same plane as his more popular and more serious operas, “Manon,” “Thais,” and “Werther,” but with a cast and production as likeable as this, it makes for an engaging night at the opera. Bertrand de Billy conducted the Met orchestra with panache. My suggestion to the Met is to bring “Cendrillon” back for a Christmas run as a children’s program in a truncated, English language version.